N.C. 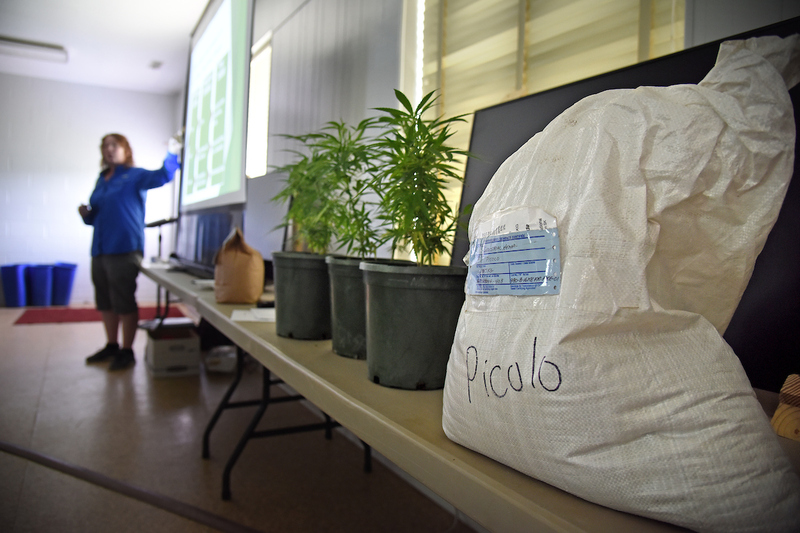 Cooperative Extension agents have hosted more than 16 Industrial Hemp Informational Sessions and Workshops during the 2017-2018 growing season. These “Hemp Info Sessions” generally last 3-4 hours and have Hemp Specialists, North Carolina Department of Agriculture and Consumer Services personnel, Hemp Researchers and real-life growers and processors present to educate attendees about this new and emerging crop. Some topics covered are licencing information, compliance, THC-testing, growing information, pests, and disease issues and other relevant information. A panel of licensed growers and registered processors answers audience questions about their experience in the Industrial Hemp Program following the presentations. Bag of industrial hemp seeds and plants on display during a information session. Turn-out at these events is extremely high. Some events had more than 200 attendees! Farmers across the state are extremely interested in this emerging crop and are seeking information from their local cooperative extension offices. These info sessions disseminate valuable information and research on industrial hemp to interested stakeholders across the state. If you are a member of the public and would like one of these events to be held in your county, please contact your local N.C. Cooperative Extension office. Click the tab for “County Centers” at the very top of this page to find your local office. If you are an N.C. Cooperative Extension agent who is interested in hosting one of these “Industrial Hemp – Info Sessions” in your county, please login to the “Agent Resources” tab on main menu for more information or email the program.